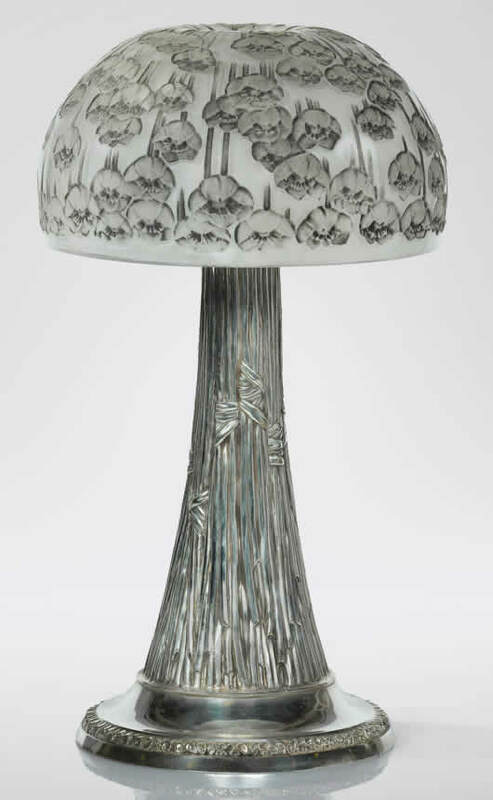 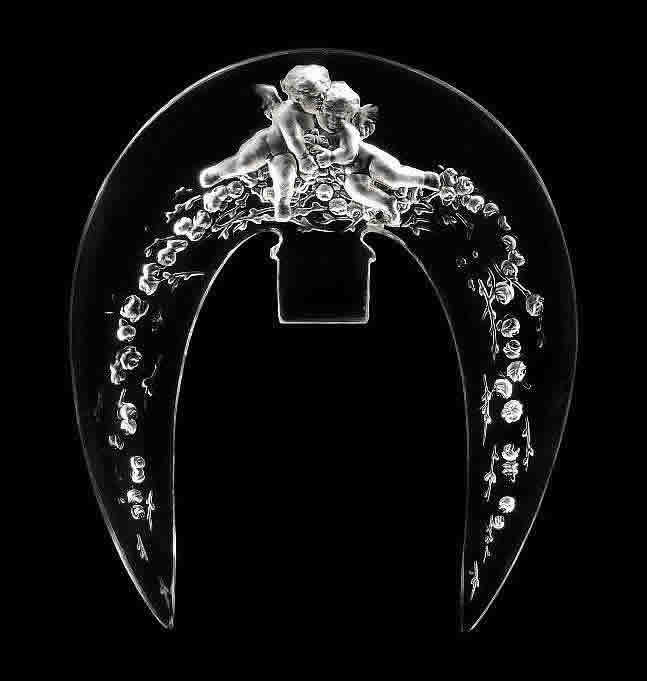 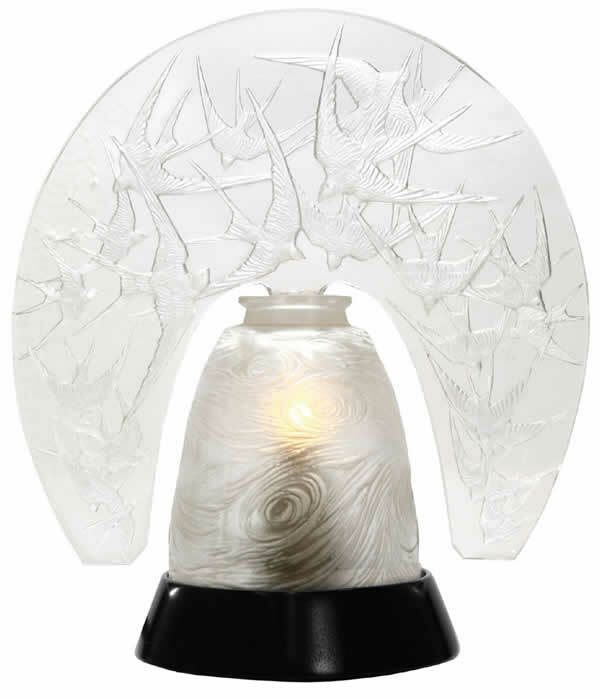 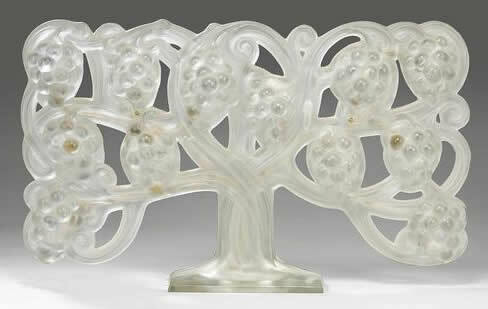 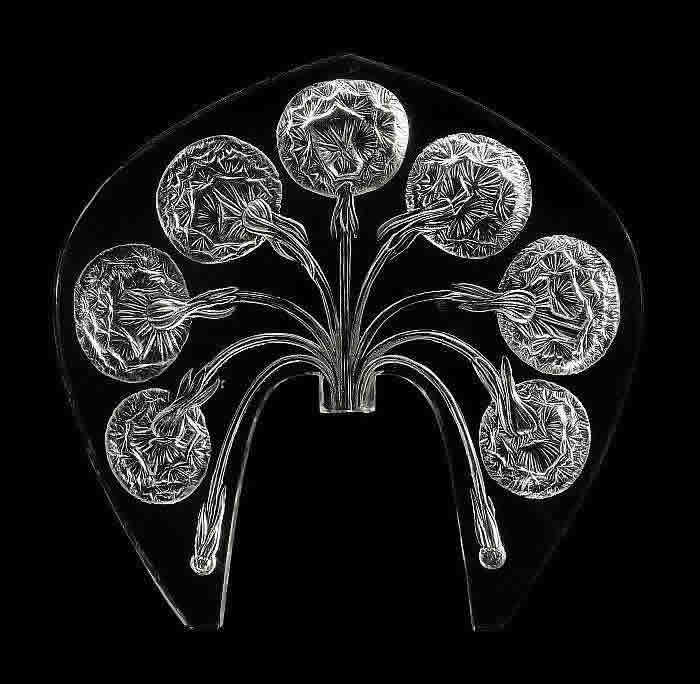 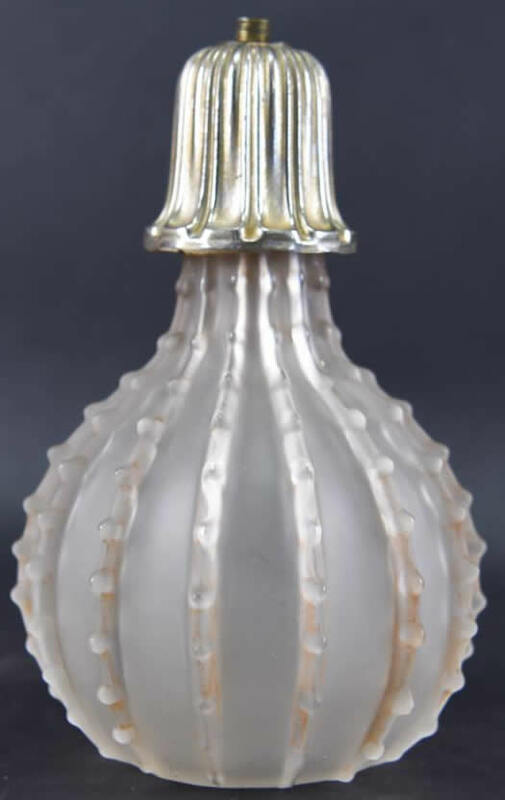 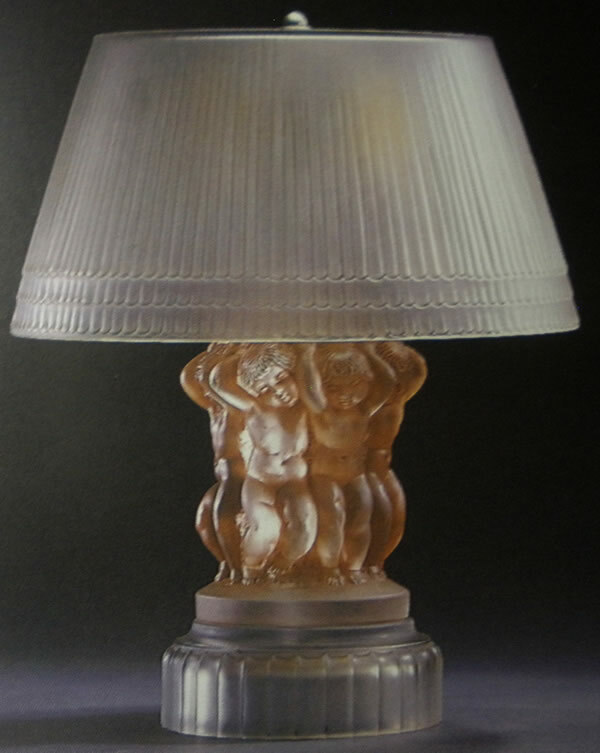 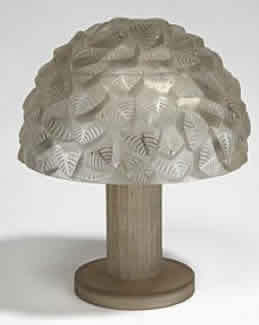 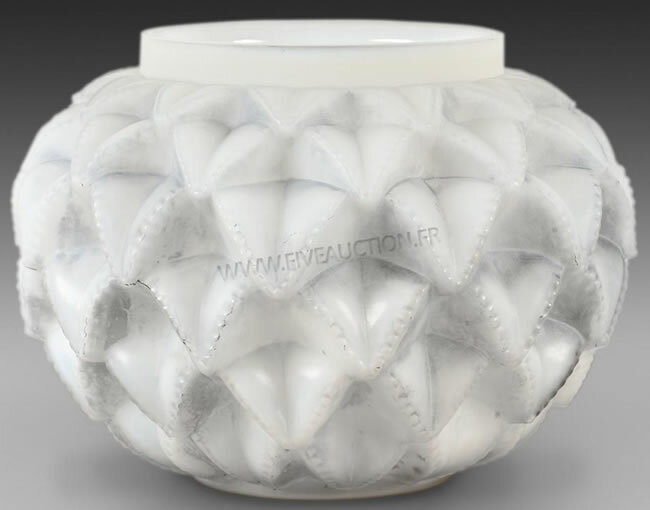 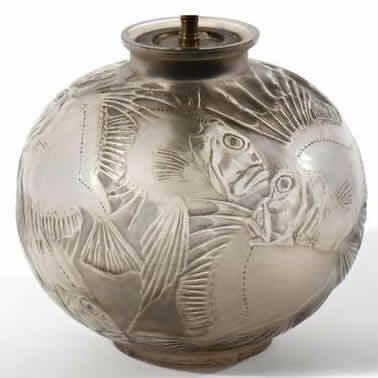 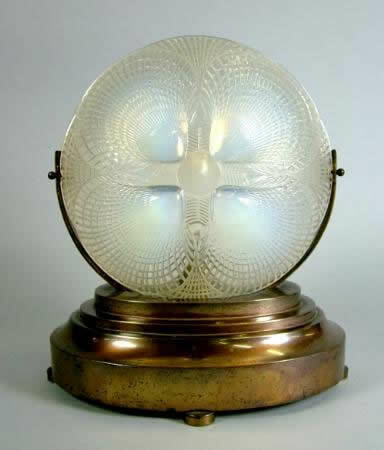 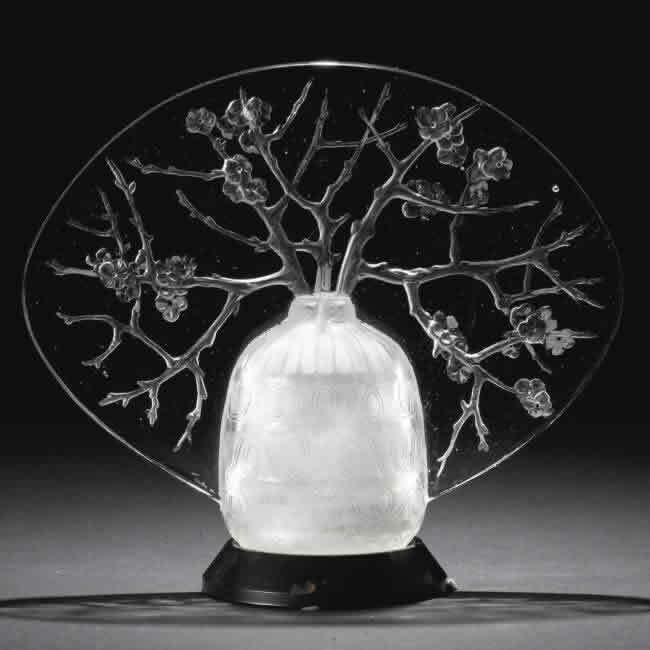 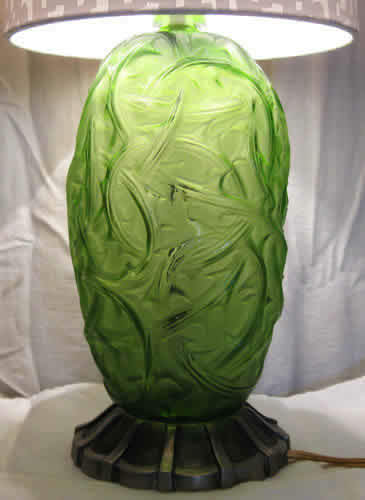 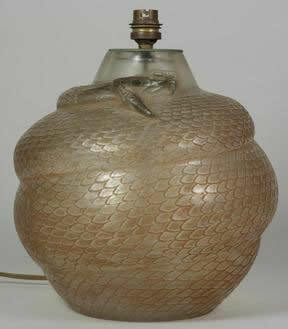 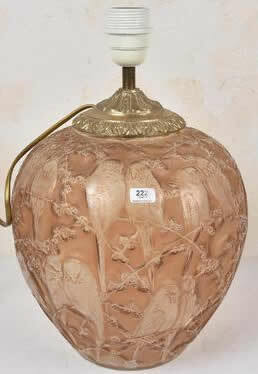 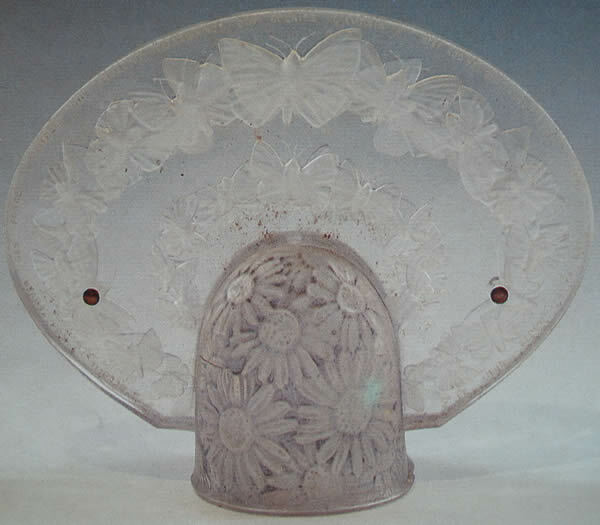 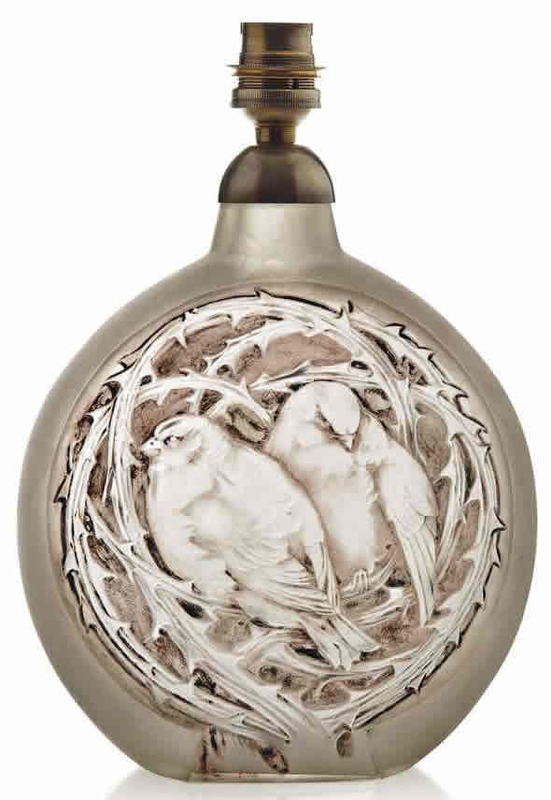 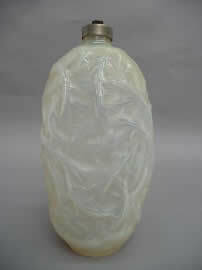 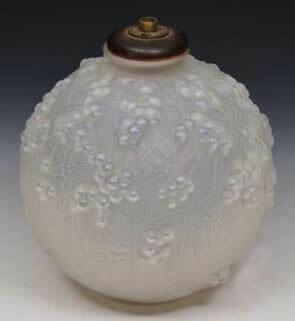 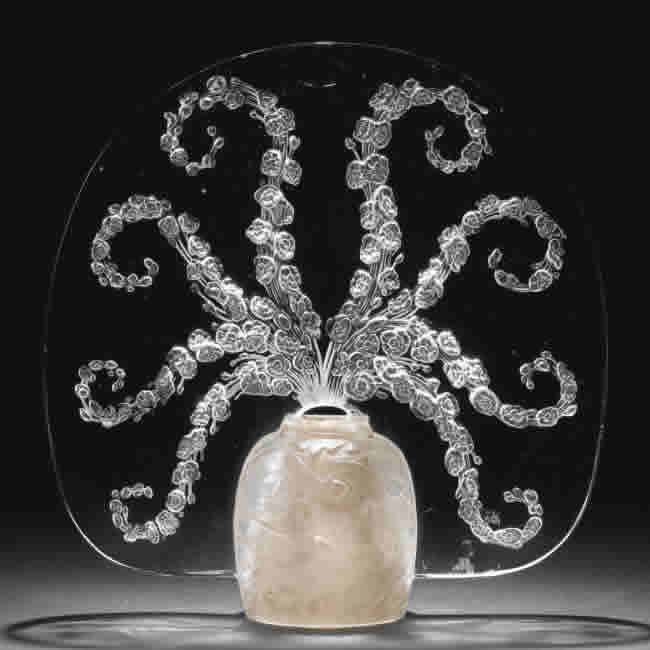 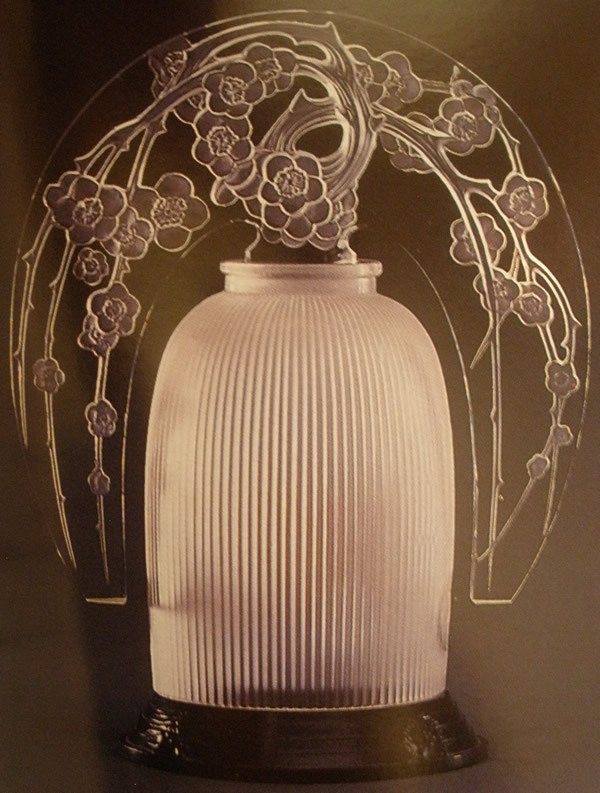 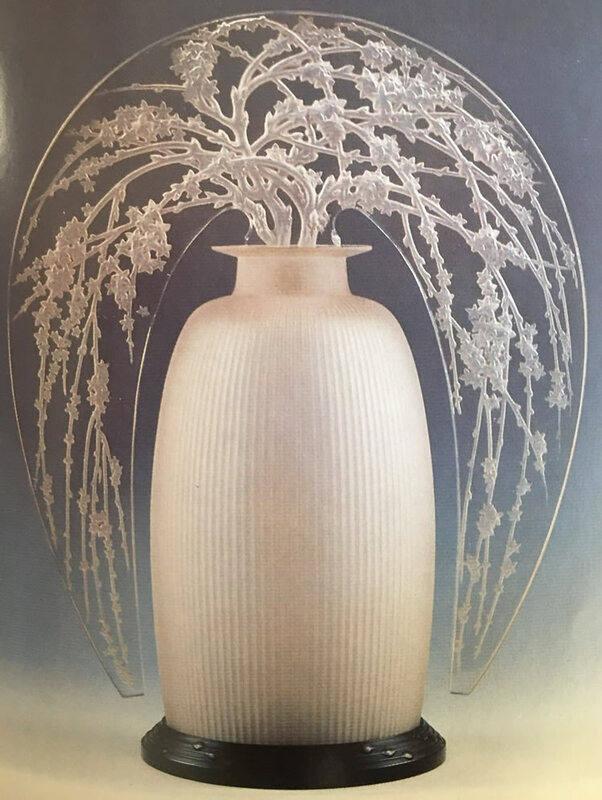 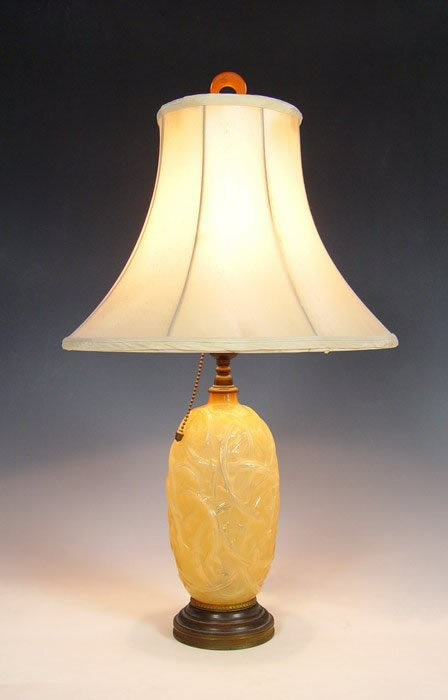 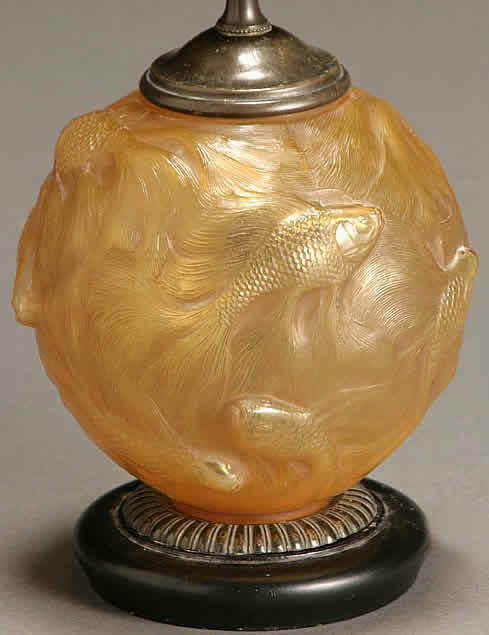 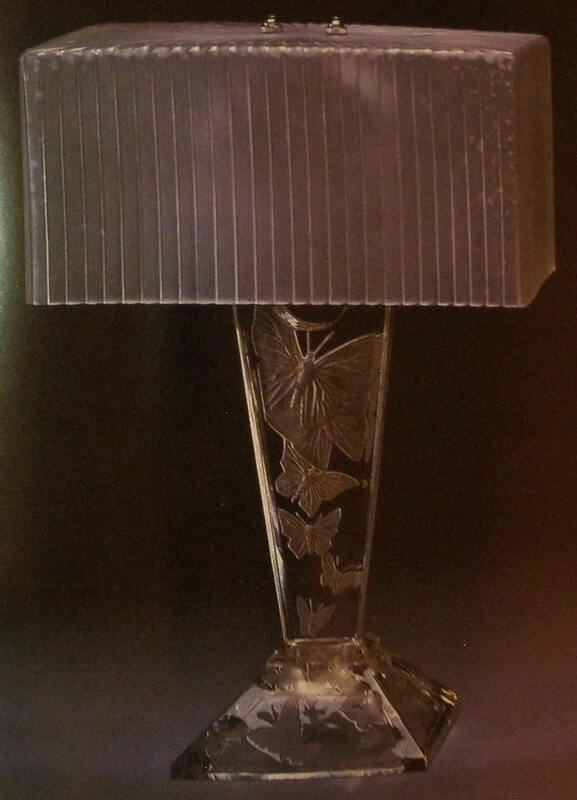 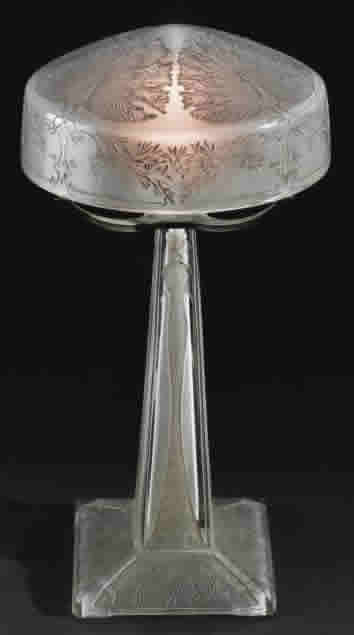 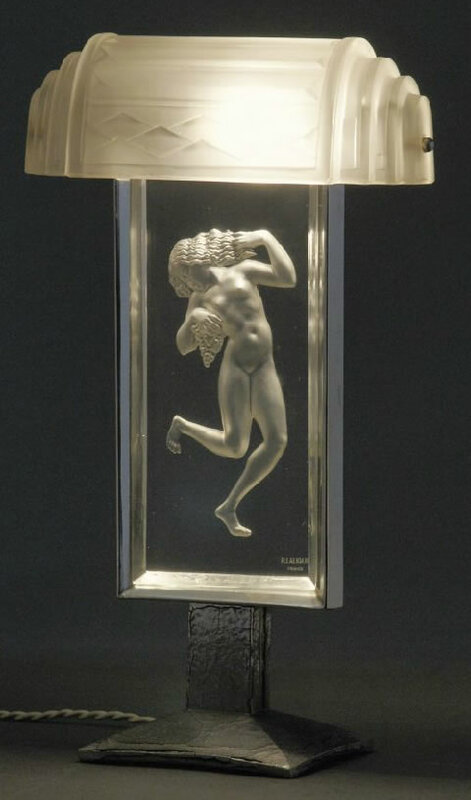 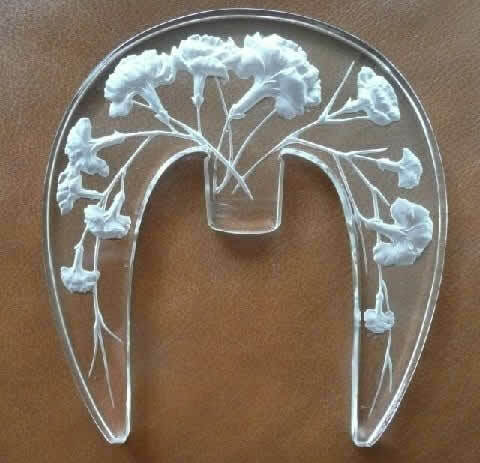 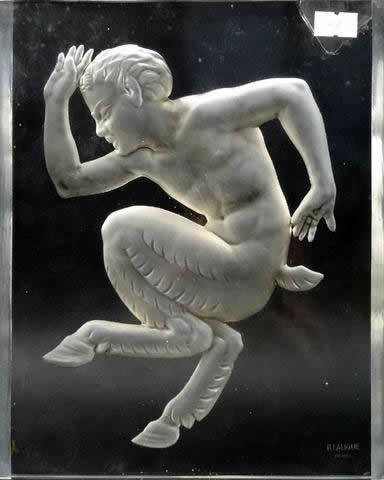 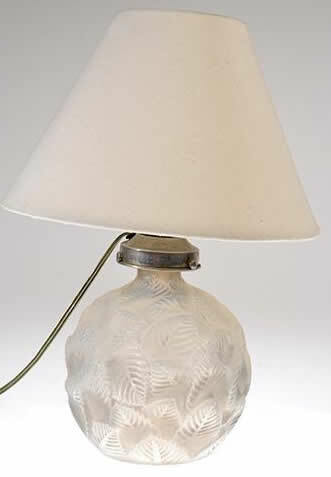 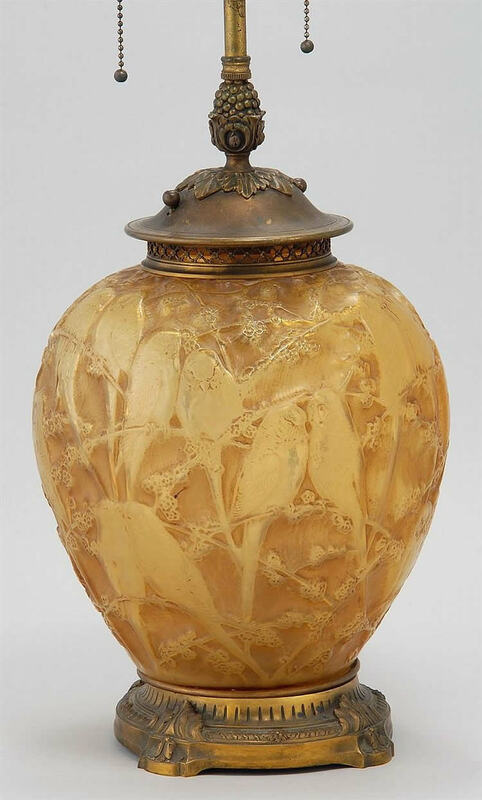 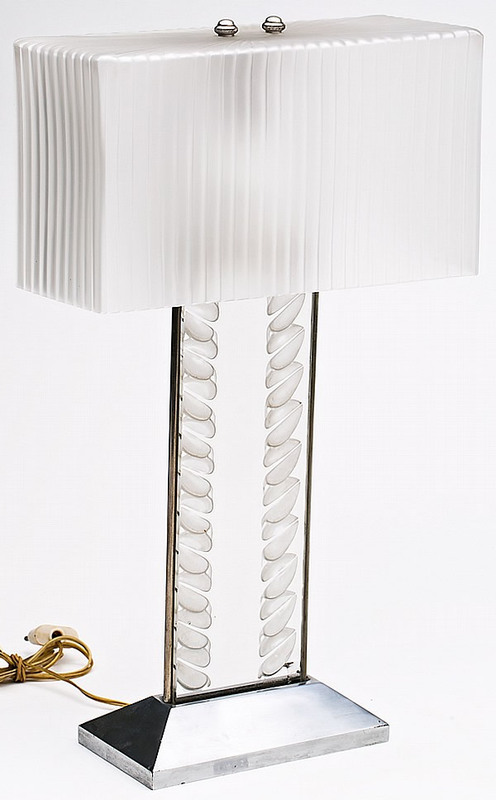 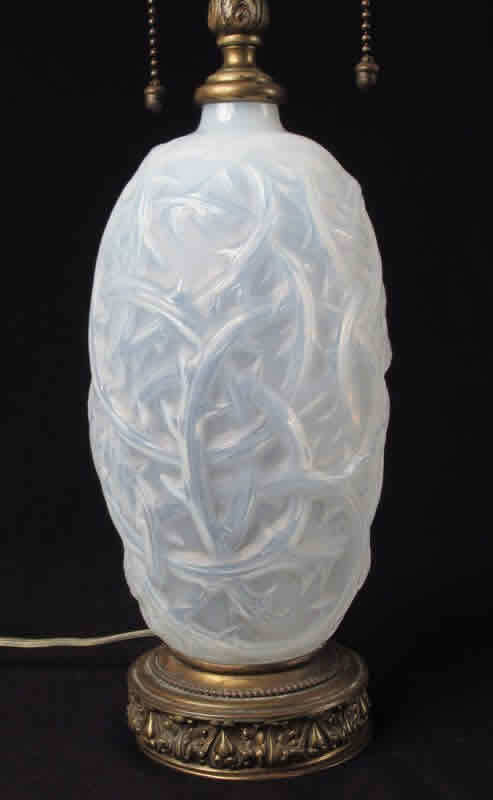 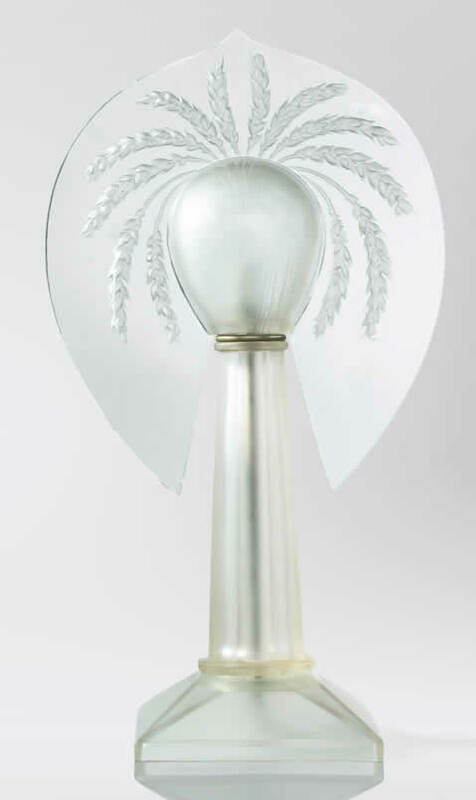 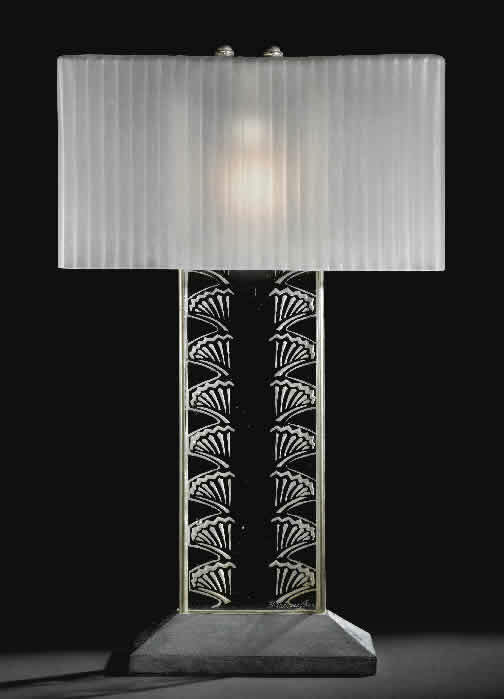 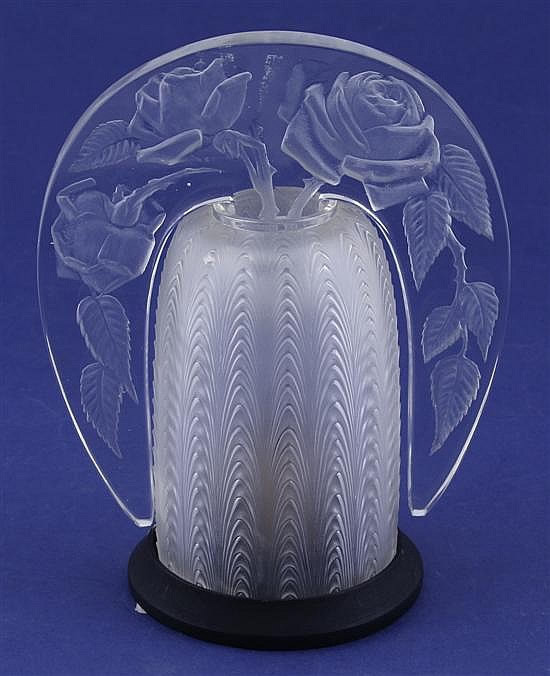 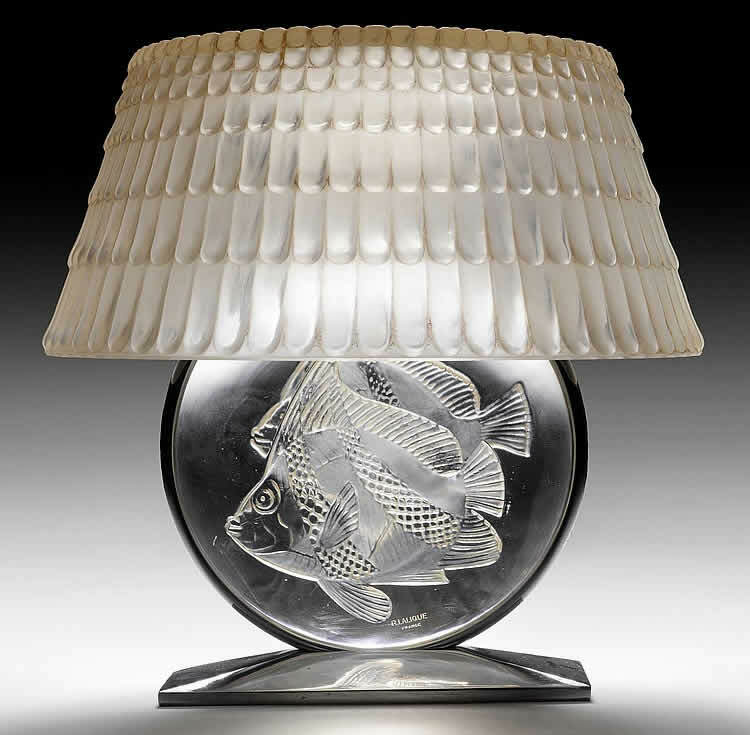 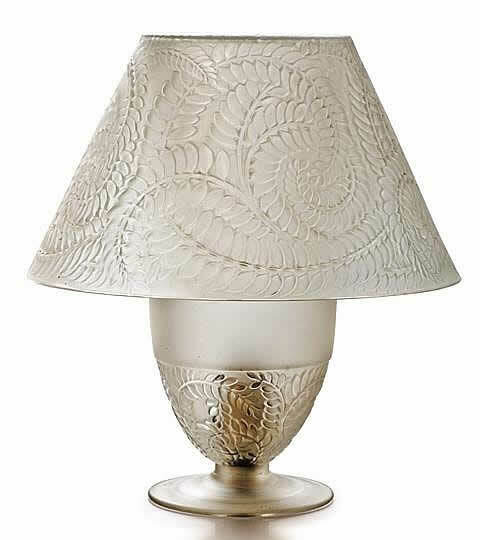 Rene Lalique Lamps: On this page is an example of each model of Lalique Lamp in our database. 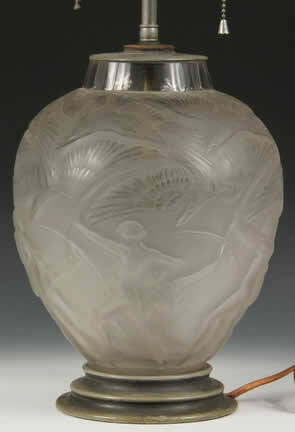 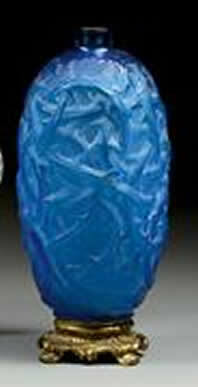 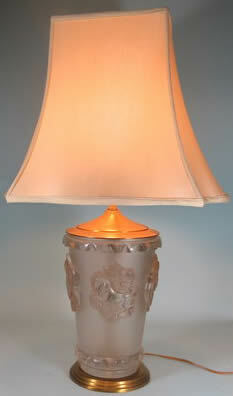 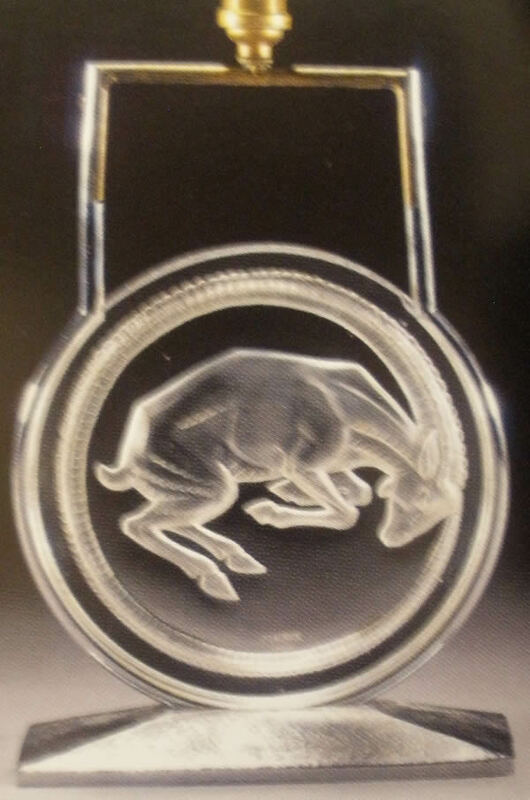 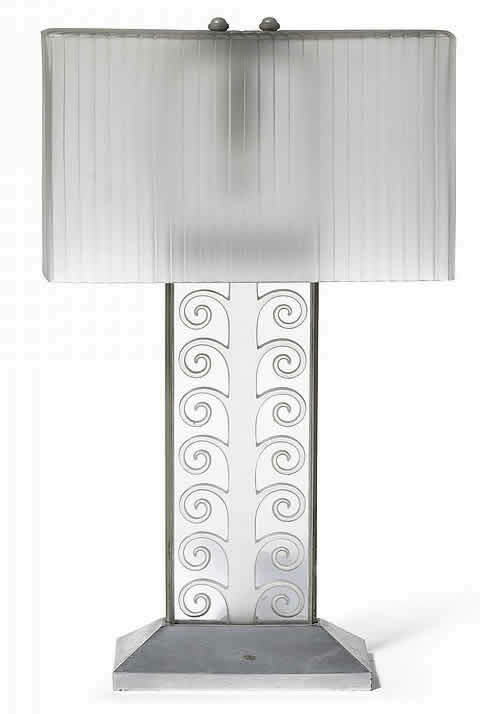 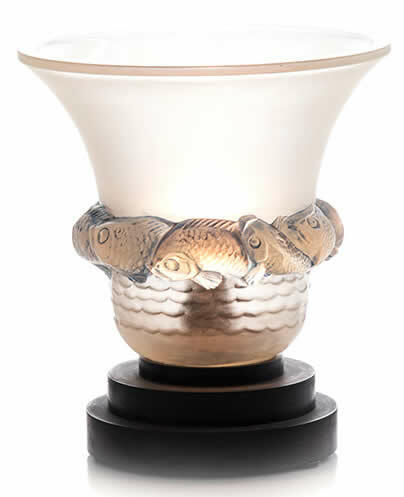 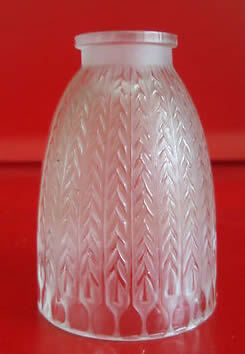 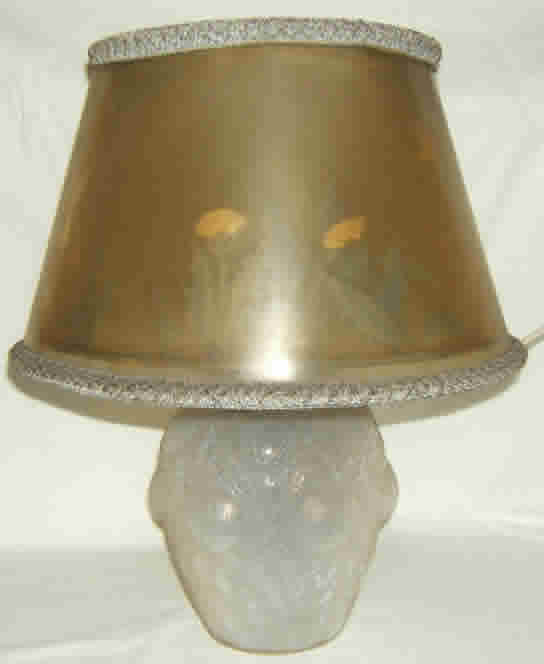 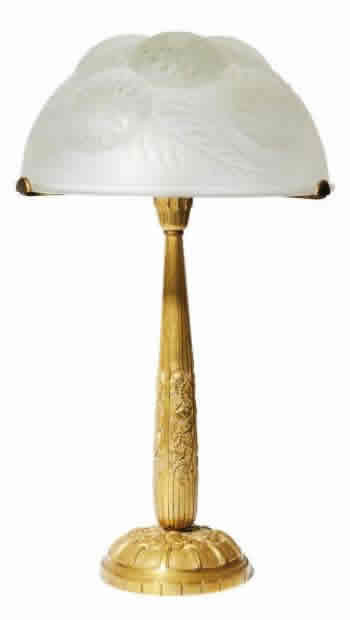 The links will take you to the main page for each R. Lalique lamp model. 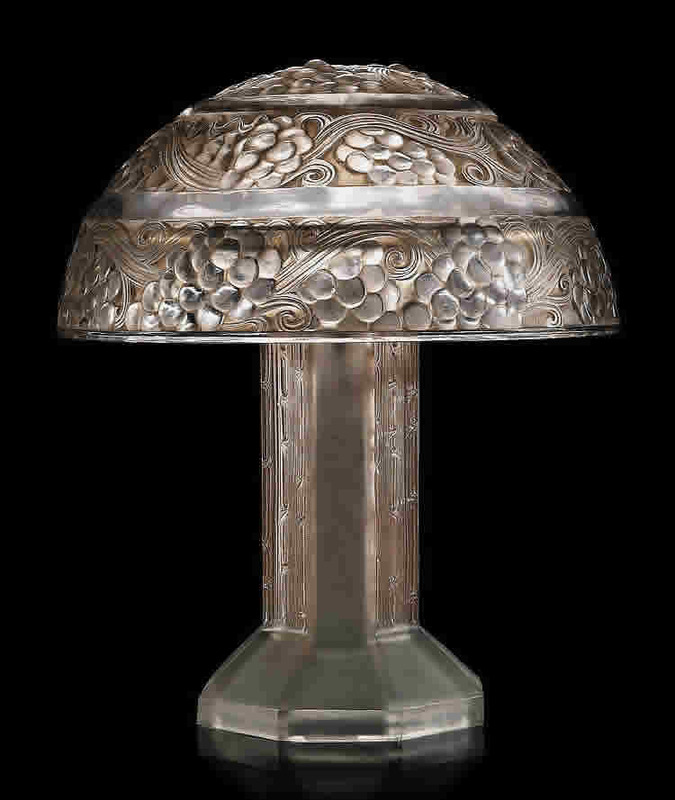 That main model page will contain a wealth of information for each model and links to other sections of the website relevant to that particular design. 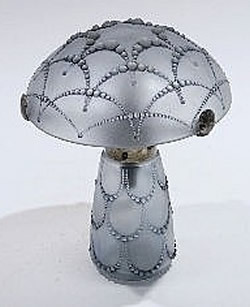 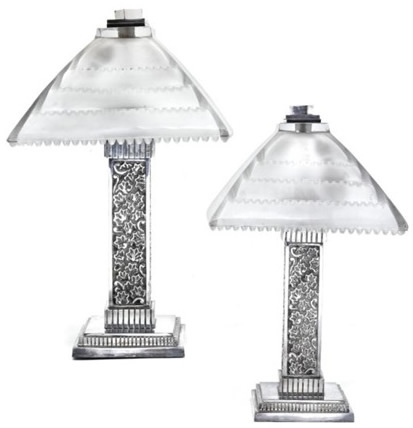 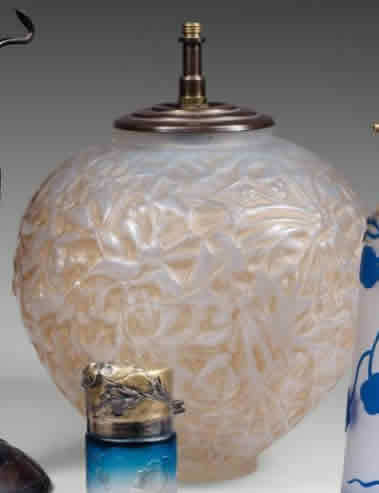 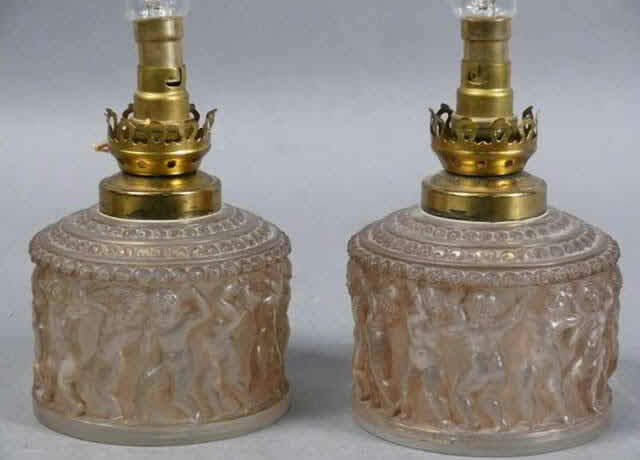 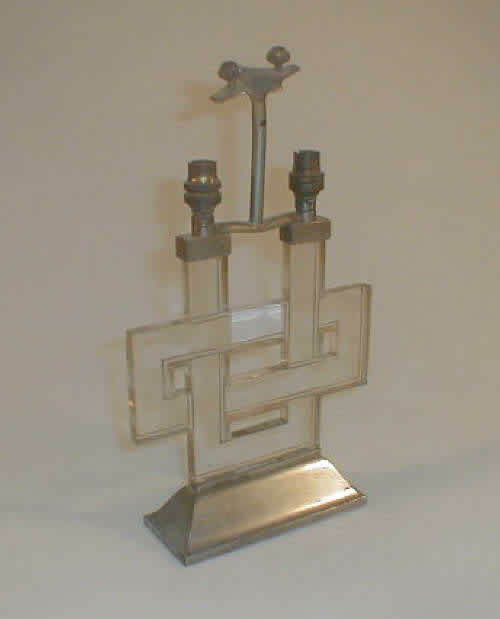 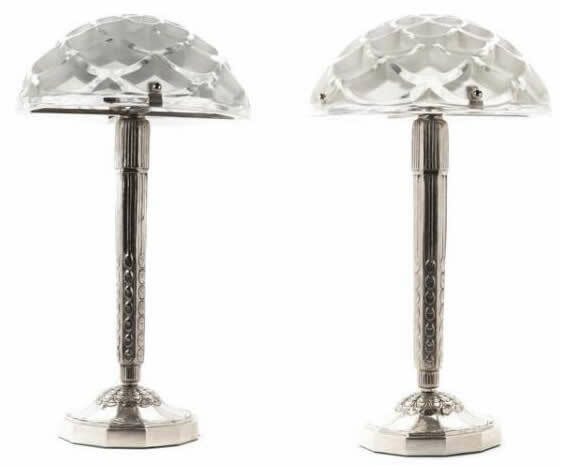 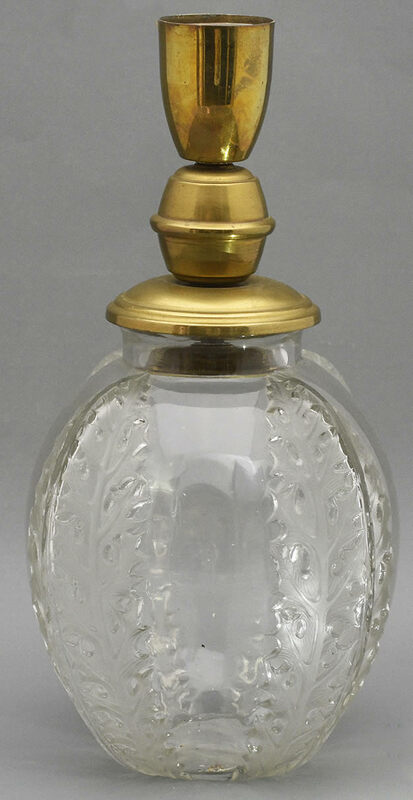 Lamps include some lighted decorations originally made that way by Rene Lalique et Cie. Veilluses (small lamps) to include some veilluse models made as perfume burners are also included here. 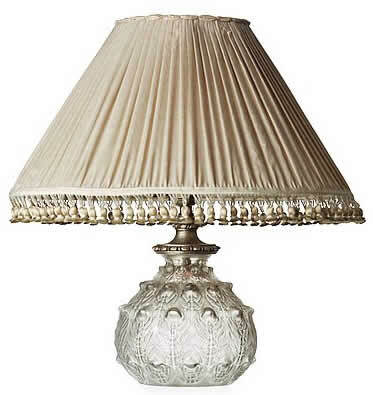 If you don't see your lamp here, check Perfume Burners, Decorations, and Architectural for other lighted objects that are sometimes called lamps. 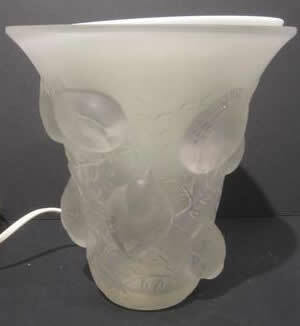 Also check Bowls and Chandeliers for objects that might have later been converted to make a lamp. 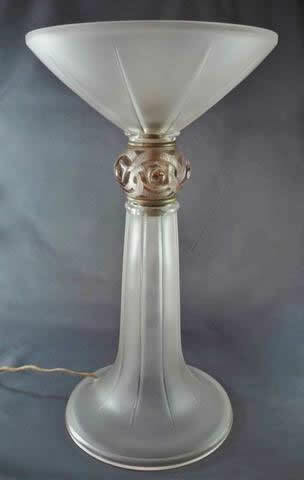 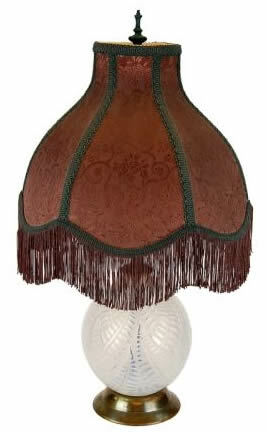 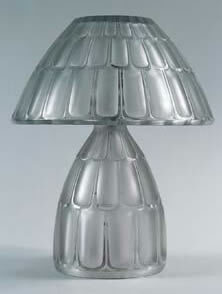 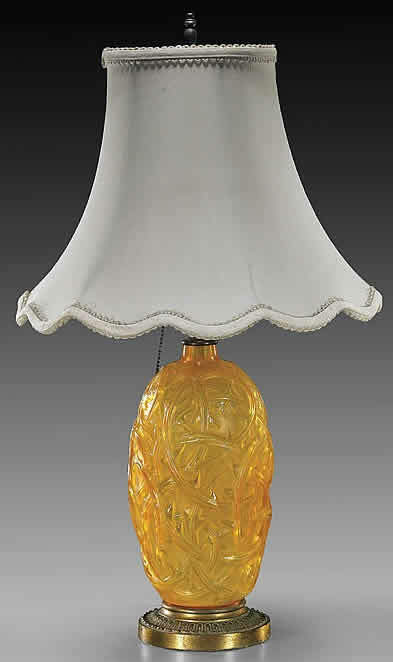 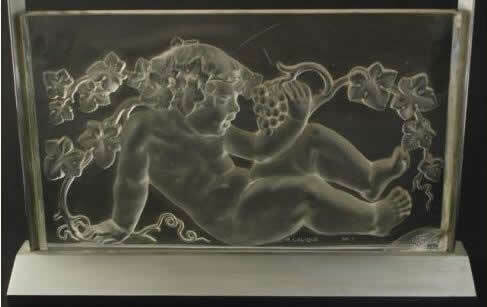 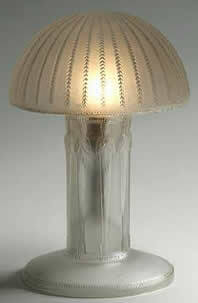 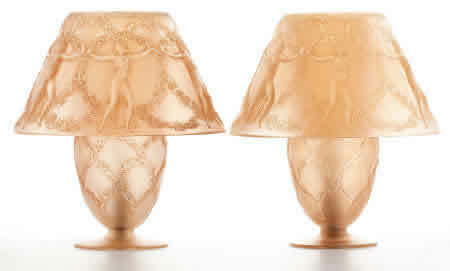 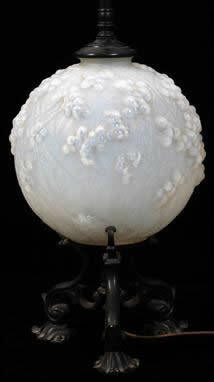 And look in Shades for lamps created using R. Lalique tulipes and other shades. 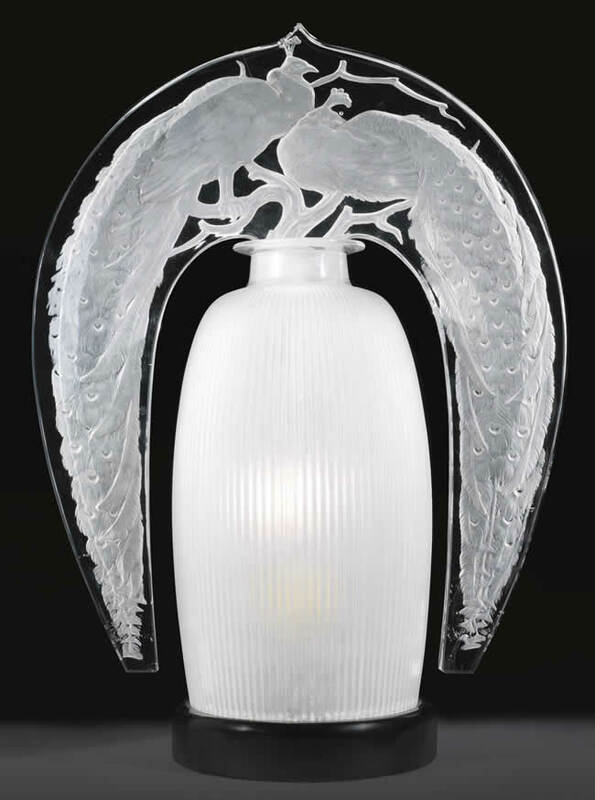 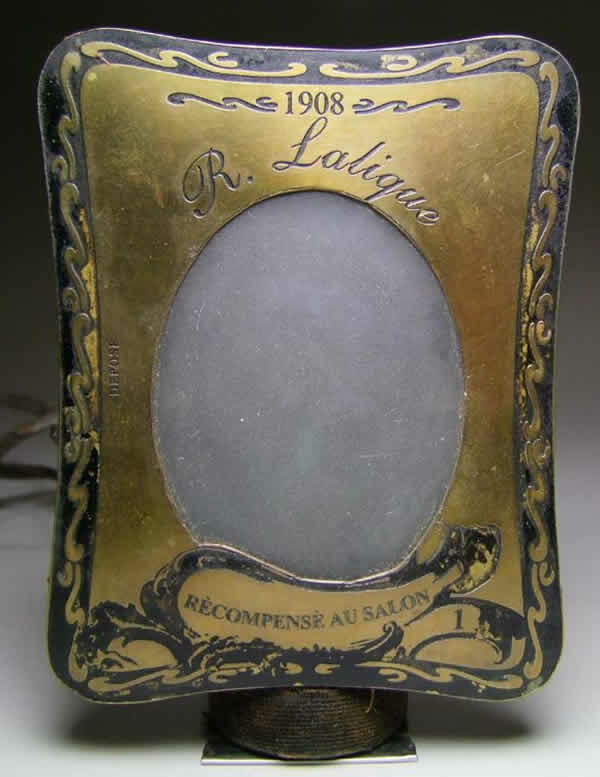 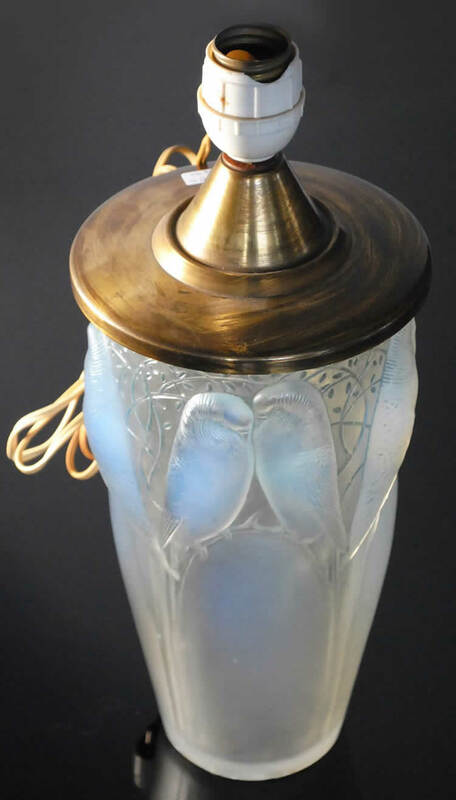 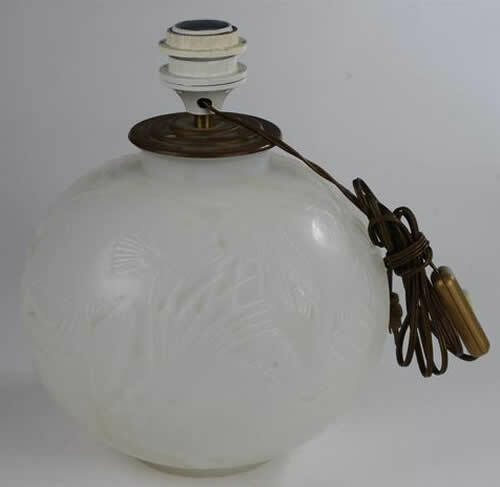 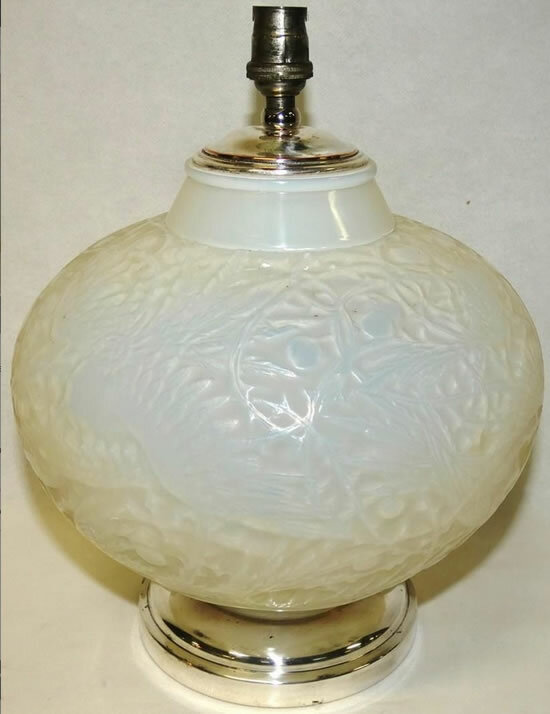 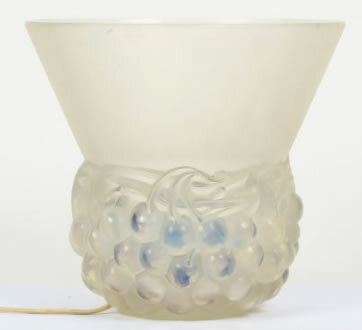 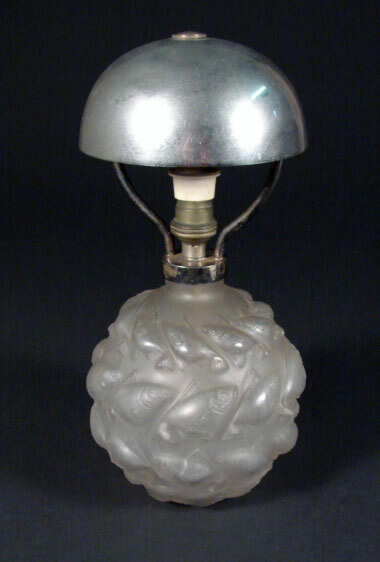 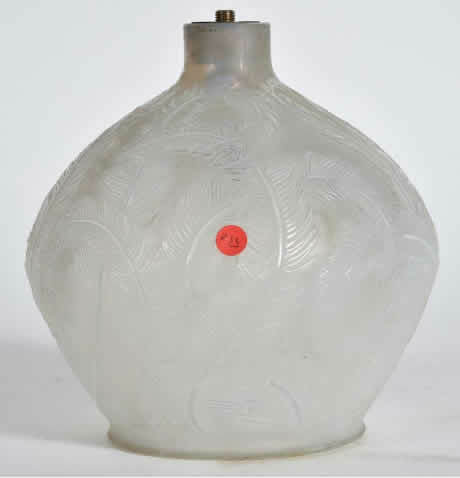 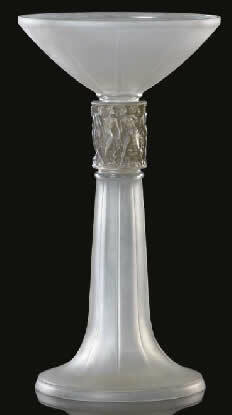 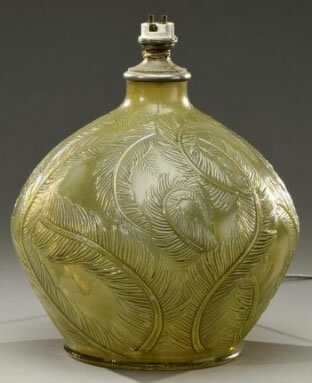 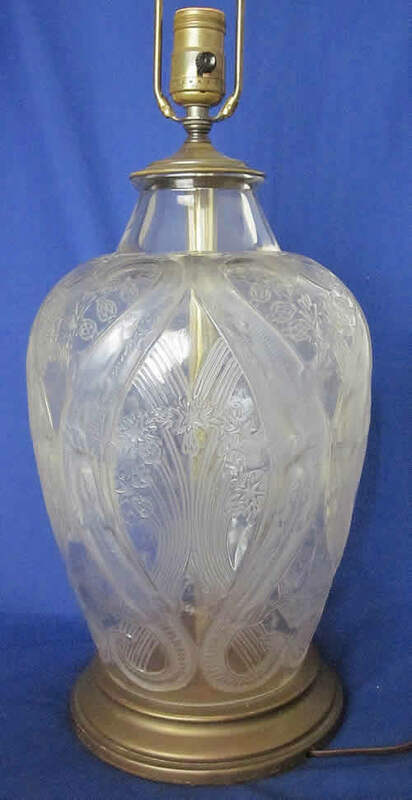 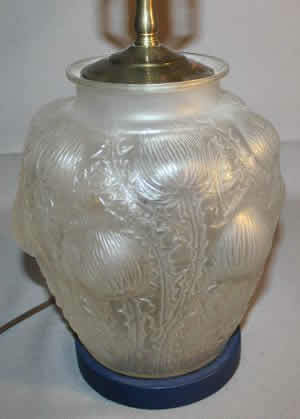 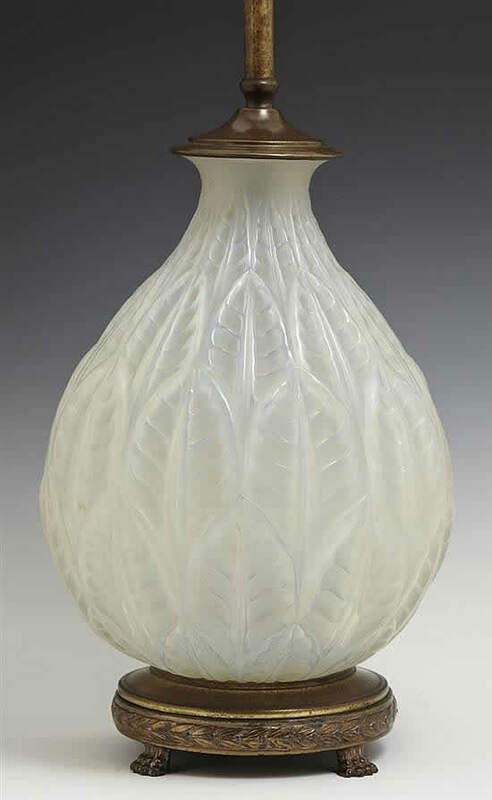 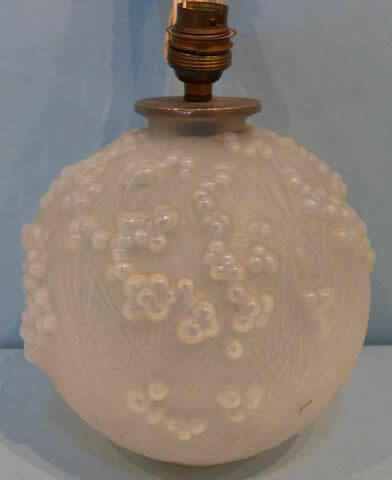 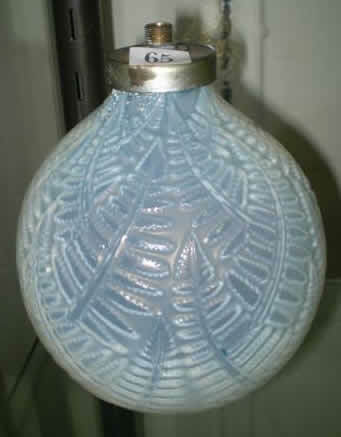 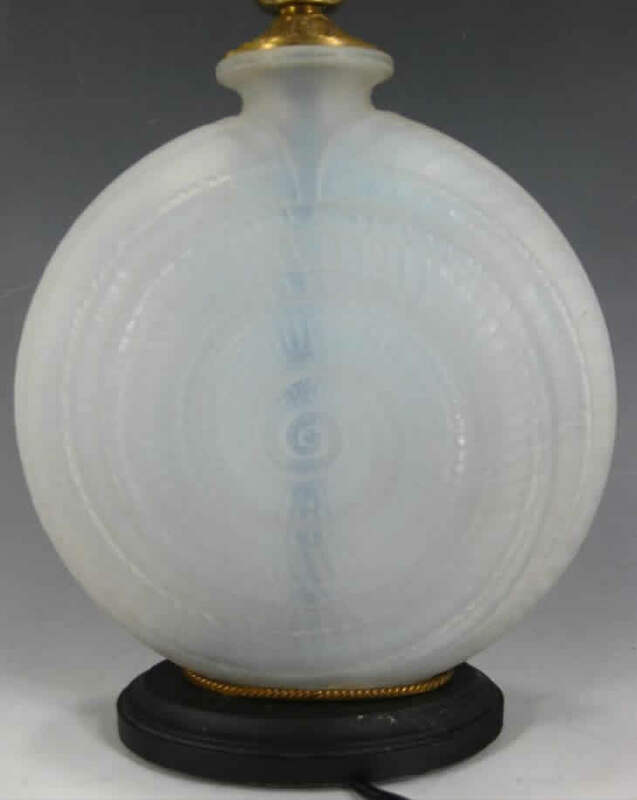 NOTE: Many R. Lalique items such as vases, bowls and even perfume bottles were converted to lamps after they left the factory. 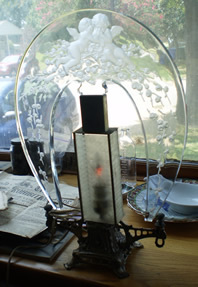 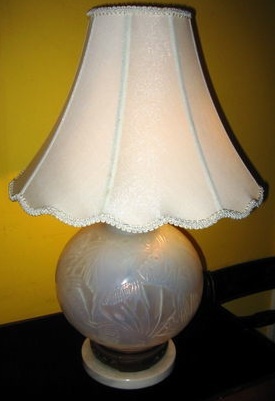 Many items later converted to lamps currently are shown below after the factory lamp models. 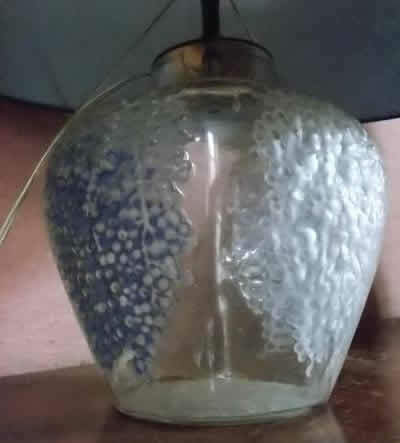 So a Ronces Vase that was converted to a lamp will appear below, and that photo will link to the Ronces Vase page. 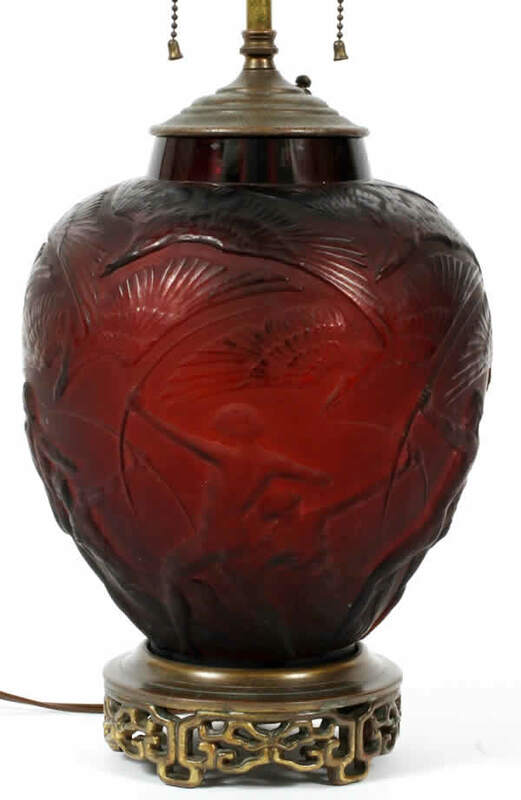 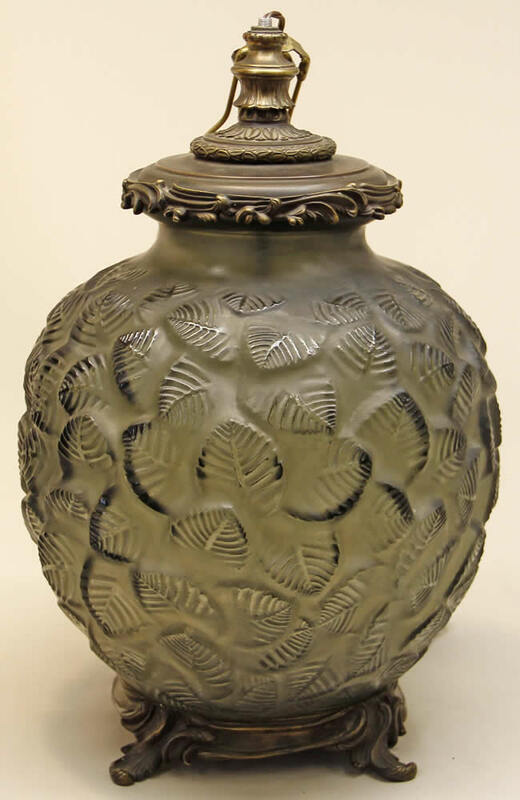 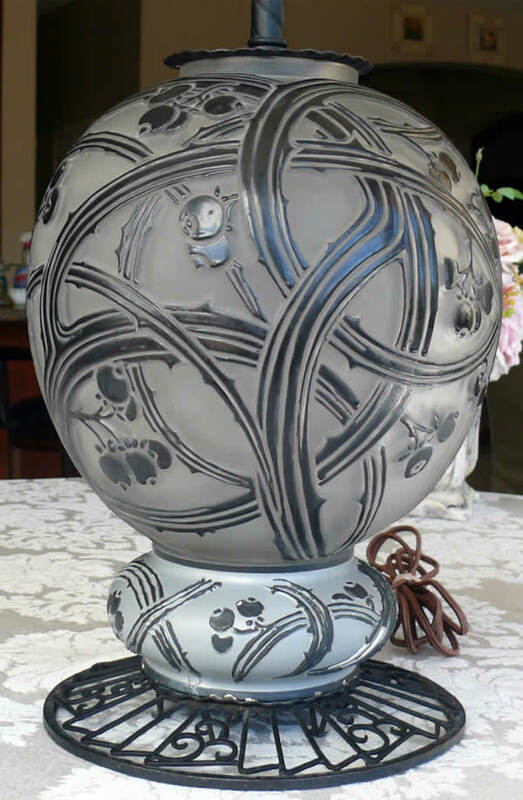 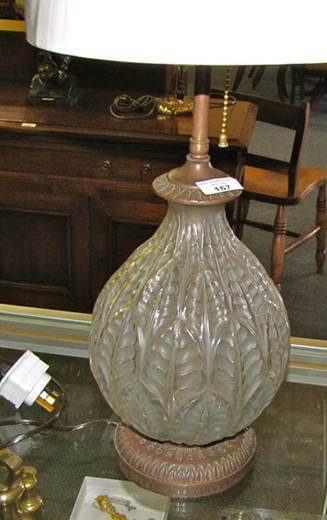 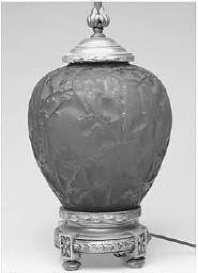 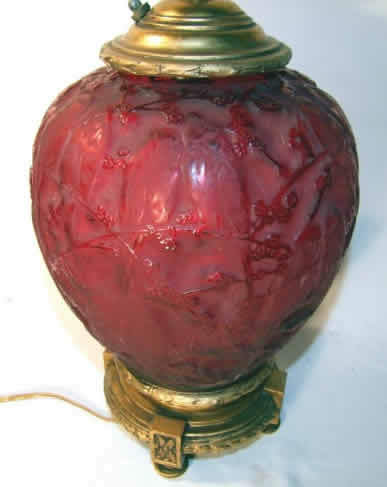 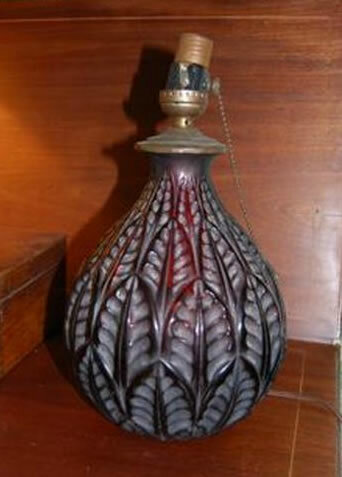 Certain vase models were made into lamps at the factory. 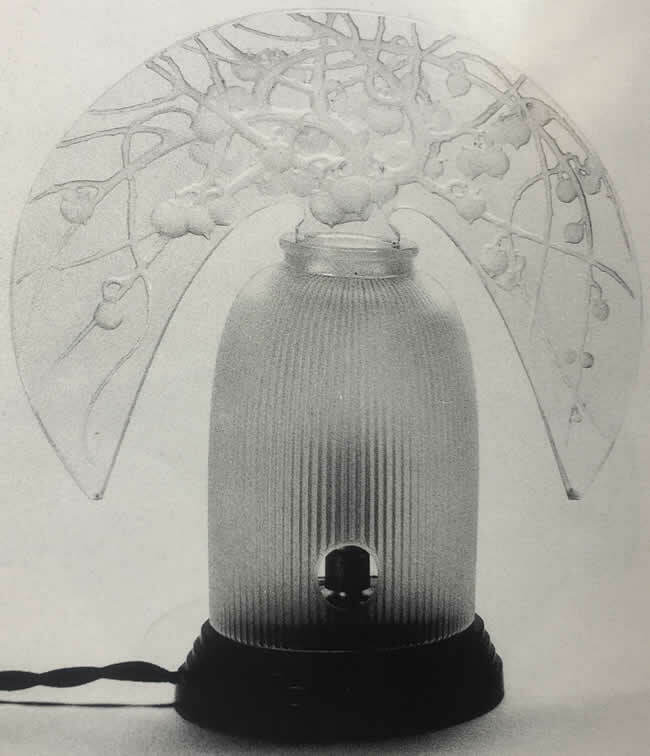 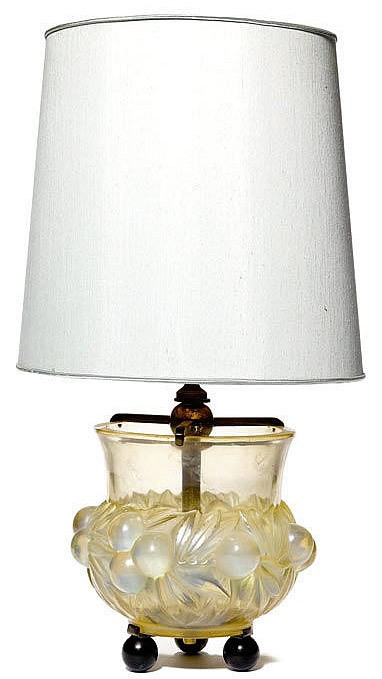 These models, if they are the factory original versions and not later converted vases, are shown along with the other commercial lamps in the first section.